Posted: June 20, 2017 10:00 a.m.
Vanderhaeghe is best known for his trilogy of award-winning literary westerns. His honours include three Governor General Awards for Literature, a Faber Prize in Britain, the Lieutenant-Governor’s Arts Award for Lifetime Achievement in the Arts, and the Order of Canada. Book lovers around the world know him as an exceptional storyteller, but for many in the University of Regina alumni community he is also an admired educator, cherished friend, and someone who is as humble as he is talented. In addition to being an accomplished academic Krätzig, in his role as the first in-house RCMP researcher, examines questions of training and officer performance and is a strong advocate of evidence-based policy decisions for police training and practice. He has led many national and international research projects and is responsible for setting the global standard for simulated firearms training in Canada. 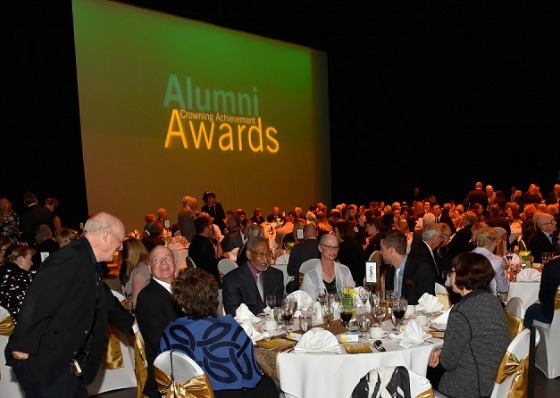 Dagenais has served the University of Regina Alumni Association as a board member, committee member, on the executive and as a representative to the University of Regina Senate. She has also shared her considerable expertise through her work on the CIDA funded University of Malawi Polytechnic Technical, Entrepreneurial, Vocational Education Training Reform project. In addition to instructing university students in music history and church music across Canada and the United States Halmo has, with a fellowship and various grants, published extensively in her field. She has also made invaluable contributions to the province as the founding member of Allegro Montessori Elementary and Preschool; in preserving Trounce House, Saskatoon's oldest building; and in the restoration of the Provincial Heritage Property, Gustin House. As the CEO and president of the multi-million dollar First Nations owned corporation FHQ Developments Ltd., Benjoe works to create employment and contributes to community economic development. He was born and raised in Muscowpetung First Nation Saskatchewan and went on to receive his education at the First Nations University of Canada. Tickets and further details about the 2017 Alumni Crowning Achievement Awards dinner will be available in August. For further information, please contact Alumni Relations at 306-585-4503 or uralumni@uregina.ca.